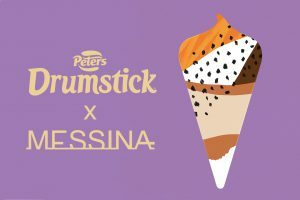 On its website, Messina said it was not its first collaboration, citing the Gelato Messina Tim Tam range in 2017. “With any ice cream creation, we are hard task masters when it comes to product development” the website said. “For this range, we spent countless hours working with the Drumstick team (shout out to Dave who was an absolute legend in that department) making a product which drumsticked all our boxes. “We’re really bloody happy with the results, and when you taste them, we think you will be too. Fresh Kensington Pride mango sorbet entwined with Murray River Salted Coconut sorbet, swirled with Kensington Pride Mango sauce and topped with toasted coconut flakes. Rich three fold vanilla bean ice cream, topped with a sweet & salty peanut praline and dark chocolate sauce. A unique MESSINA hazelnut sauce swirled through indulgent chocolate gelato, topped with roasted hazelnuts all the way from Cortemilia in Italy. This one of a kind flavour is made with milk chocolate ice cream, MESSINA’s trademark Dulce de Leche sauce, mixed with chocolate coated biscuit pieces. Supermarkets will sell all four flavours in boxes of four for RRP $9.99, and convenience stores will stock the Mango & Salted Coconut and Roasted Hazelnut flavours separately for RRP $4.90.